As an addition to its Q63 range of research and lab-grade steam sterilisers, Priorclave has released the new 400l front-loading laboratory autoclave. With a taller profile than most cylindrical machines, its chamber gives the autoclave a large load capacity with up to 20% more space. This makes it ideally suited for sterilising larger bulky items. Users will also benefits from a lower loading height of just 725mm. For laboratories wishing to acquire a high-capacity, front loading cylindrical chamber autoclave with an exception pack density at a more affordable price, the new 400l autoclave could prove the ideal choice. While offering greater loading versatility with much easier and safer chamber access, features such as forced air cooling to reduce cycle times and automatic timed free-steaming for improved air removal add to the overall sterilising performance of the Q63 autoclave. 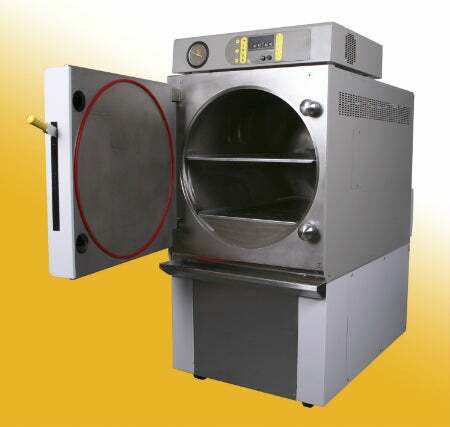 The design of the new machine is based on a proven build quality of the smaller 320l autoclave. It is also reliable, complies with international standards, and features an advanced micro-processor control system that simplifies programming and maintains a watching brief to optimise the sterilisation process. The machine can be configured to log all temperature, pressure time, and cycle data into a single compact archive file, which can be subsequently forwarded from anywhere in the world directly to Priorclave’s UK Service Centre for technical assistance. The build quality of the new autoclave uses epoxy coated panels and frame members treated with an anti-bacterial agent, which is highly effective against all bacteria and fungi including MRSA. The Q63 laboratory autoclave and research steriliser range can be applied across many sectors, including food and beverage, dairy, pharmaceutical, education, and microbiology.